Most organizations have their own custom sets of behavioural competencies that clarify the expected competencies, but don't provide guidance to employees on how to develop these competencies. 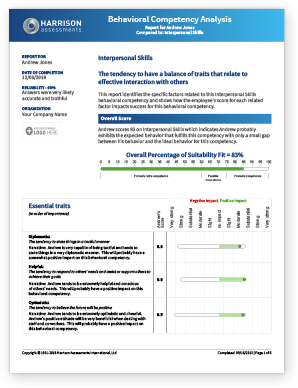 The Harrison Behavioural Competency Assessment provides an in-depth analysis of the employee's tendencies and behaviour related to any behavioural competency. This allows employees to understand their strengths and weaknesses related to each competency and provides an actionable roadmap that inspires and guides them to develop behavioural competencies. Your organization's behavioural competencies can be built into the Harrison System enabling you to measure and guide development for your specific competencies. You can use our Competency Libraries to select the behavioural competencies you wish, or you can adjust the competencies to reflect your exact behavioural competencies. You can create custom sets of competencies that reflect your organization's culture and expectations. Leadership Competencies- These sets of behavioural competencies enable leaders to deeply understand their own behaviours in relation to best practice. There are ten behavioural competencies in each of the Senior Leader Set and the Emerging Leader Set. Emotional Intelligence Competencies- This set of 4 behavioural competencies provides a detailed insight into the four areas of emotional intelligences including: Knowing Oneself, Relationship Leadership, Self-Motivation & Self-Management, and Social Awareness & Service Orientation. Collaboration Competencies- This set of 5 behavioural competencies enables employees to gain insight into the key areas necessary to build a collaborative culture. Harrison General Behavioural Competencies- This set of behavioural competencies provides a range of different competencies such as judgement, and coaching that can be used for recruitment or employee development.